1Hover your mouse over the Profile link in the top navigation bar and select Edit Profile from the drop-down list that appears. 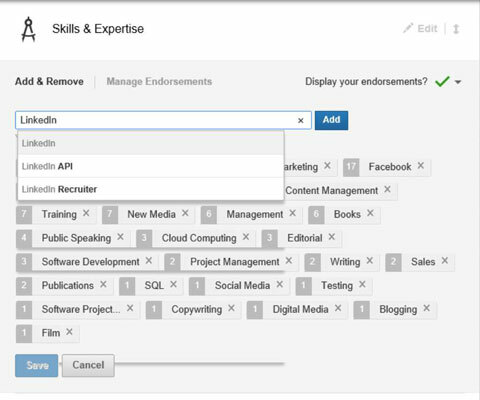 This allows you to edit your LinkedIn profile, which is necessary when you want to manage your skills listings and endorsements. 2Scroll down to the Skills & Expertise section of your profile and click the Edit link (with the pencil icon) next to the Skills & Expertise header. 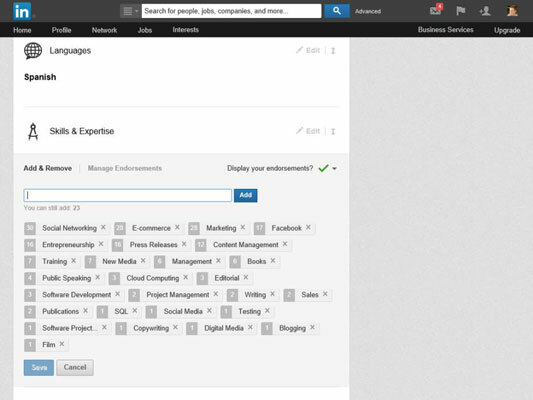 This opens up a new section below the Skills & Expertise header to help you manage your skills listings and endorsements of those skills. There are two options: Add & Remove and Manage Endorsements. By default, you see the Add & Remove options first. 3If you want to add a skill to your list (so people can endorse it later) simply type in the name of the new skill and then click Add. When you're done, click the Save button to save your changes. You must click the Save button before doing anything else, like managing your endorsements. Otherwise, any skills you add won’t be saved to your profile. As you start typing the name of your skill, LinkedIn automatically prompts you with possible skill names based on other users’ profiles. You can click the option that best matches what you want, or finish typing your own skill name. You don’t have to accept what LinkedIn prompts you for, especially if you are trying to ensure the right keywords come up for your skills profile when other people review it. 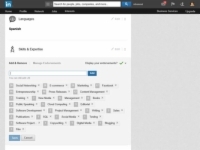 4To manage your endorsements, click the Manage Endorsements link. Click the name of the skill that was endorsed and then click any person's name to deselect the check box, effectively hiding that person's endorsement from your profile. 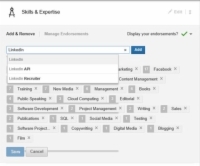 On the Manage Endorsements screen that appears, your skills are sorted by the number of endorsements you’ve received for each skill, from highest to lowest. 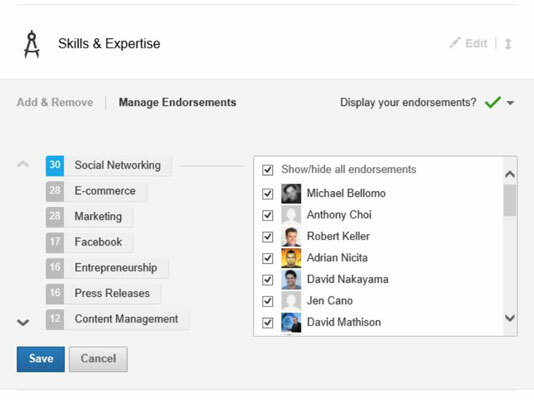 Click the arrows next to the number of endorsements to scroll up and down the list of skills, and use the scroll bar on the right side to scroll through the names of your connections that endorsed the highlighted skill. If you want to remove all the endorsements for any given skill, simply deselect the Show/Hide All Endorsements check box. 5Repeat Step 4 for any other endorsements you want to hide from your profile. When you're done, click the Save button to save your changes. After you finish with your changes, you see the Skills list again and the number of endorsements for your skills is updated based on the changes you made.